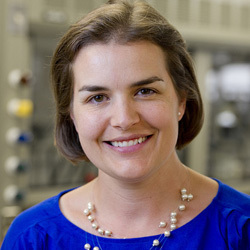 Amanda Hummon, associate professor of chemistry and biochemistry and member of the Harper Cancer Research Institute, has been appointed to the board of the American Society for Mass Spectrometry (ASMS) as Member at Large for Publications. The two-year term begins in June. The ASMS, founded in 1969, includes more than 8,500 scientists involved in research and development and attracts 6,500 people to its large annual conference, where some 3,000 papers are presented. Hummon, who joined the society in 2000, has produced 45 publications based on her research that focuses on biological applications of mass spectrometry and tandem mass spectrometry, including phosphoproteomic studies and imaging mass spectrometry of peptides, proteins, and metabolites. Last year, she received both the American Chemical Society Rising Star Award and the Joyce Award for Excellence in Undergraduate Teaching. In 2014, she received a National Science Foundation Early CAREER Award. Originally published by Gene Stowe at science.nd.edu on February 09, 2017.